I was in the mood for something a bit more harsh today so I put on Erstlive 008: Keith Rowe/Toshimaru Nakamura and played it loud. If you have a system capable of serious bass reproduction, which I do, and you play it a sufficient volume to properly propel the bass, which I did, this album throbs with sub-sonics. There are sections of it that are like the sea: an unstoppable, unimaginably powerful force rolling over you again and again. And floating in that sea are cutting blades that slice into you from the completely opposite end of the dynamic range. While there are moments of near stasis it is a restless piece, using continuity of sound like a killing floor that bounces the detritus of the machine age upon it. It feels like the end of something, something more than end of Amplify 2008 which it was. Particularly interesting to me is that for such a roiling, harsh piece it ends with a whimper, not faded out, nor utilizing long stretches of silence, but simply increasingly delicate sounds, punctuated with bursts of tearing feedback for a time, and then tones, whispers, shrill whines of tortured electronics. In this piece the world ends with a bang — and a whimper. 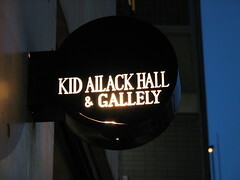 I was in Tokyo for Amplify 2008: Light and was of course in the audience for this show. This was the second time I’d seen Keith and Toshi perform as a duo and this cd is the fourth of theirs released on Erstwhile Records. Their two studio albums on Erstwhile Records, Weather Sky and Between, were each landmarks in the Erstwhile catalog and in my personal musical listening. Weather Sky seems to take ideas that Keith had worked through in AMM and look at them from another another angle. The laminal aspect is there but its much fuzzier, not so intentional with none of the exhaustion of the final AMM performances. Weather Sky gives you much less to settle into and its restlessness, which is a hallmark in my mind of the Keith/Toshi collaborations, undermines any surface stasis. Between is a completely different beast that over its two discs runs the gamut of concerns of this music. While the decision to make this album was a deliberate move it is immediately clear that retreading old ground would not be acceptable. This is not the recording of musicians who are spinning their wheels; their restlessness, pervasive questioning and unwillingness to compromise cut through any notions of a rehash. 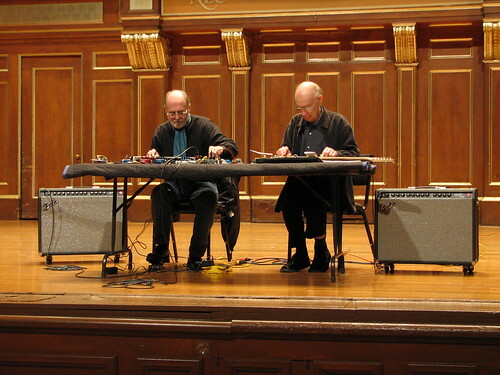 The improvised music that they participated in hadn’t sat still since the release of Weather Sky, in large part due to their work, but it was already becoming difficult to express what was becoming familiar notions with what was becoming codified gestures. It is a testament to these two musicians that they found so much to explore. No set at this festival was more anticipated by me and it did not disappoint. 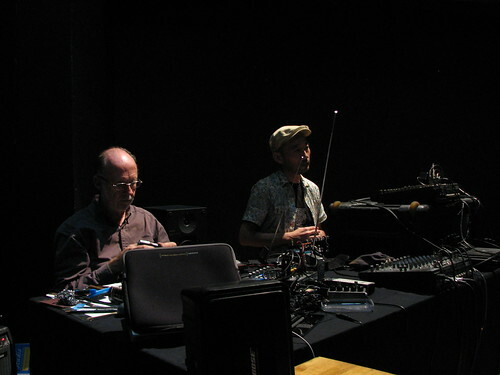 Nakamura seemed more active and upfront while Rowe explored a wider space and allowed a dominating role for the radio. As I write this I’m listening to the Keith and Toshi track on disc 5 of the Amplify 2002 box set and it does reaffirm these recollections, though there is a long section of rhythmic feedback from Toshi that so often cropped up in his solo albums from this time, a feature of his playing that rarely cropped up in the studio recordings. [As an aside it has been quite a while since I’ve pulled the Amplify 2002: Balance box set off the shelf and I have to say that among a catalog of handsome releases this box set is simply stunning.] There also is a bootleg of Keith and Toshi floating around from around this time of them playing in Texas that is in a similar vein, what I’d call typically great: the communication between these two is solid enough that whenever they play it is a great set. But what is I think is really quite impressive is that on occasion they transcend that familiar greatness and produce something transformative. Established groups rarely do this as part of the familiarity of frequently playing together is a toning down of risk: you anticipate too much and perhaps you settle into a subset of your own behavior, settling for what you know works. With this duo though it seems much more like they are working through something and it might take a while, so they have these clear “periods” but then they begin to struggle through something else. It is a working relationship akin to AMM come to think of it. Two years ago in Tokyo after seeing three impressive sets from Keith, and two very solid sets with Toshi one settled into ones seat for this duo with some expectations. After the twin breakthroughs of Weather Sky and Between and a series of always engaging concerts one would be not be remiss to expect another typically great set. Which was certainly delivered and at the time it seemed like a rousing end to an amazing festival. Even at the show I was impressed with how they had seemed to have picked up where Between left off and by perhaps by channeling the energy of the festival, or the sprawling urbanism of Tokyo or perhaps a looming sense of endings everywhere. But since then this set has come to seem increasingly powerful, that sense of uneasy doom increasing; a breakthrough of synthesis. It seems to take the pieces of Between, orient them orthogonally and reassemble them against the overwhelming sense of spareness of Kid Ailack Hall into a singular musical document. It is irrevocably colored by the experience of having been there for me, of course, but this is music whose relevance grows, music that doesn’t have that flush of fresh novelty to it but the deepness of intimacy which, from musicians who are always struggling with those ideas that are never tapped out, results in music that constantly unfolds and reveals more. A Spiral Cage is powered by	WordPress 4.6.14 and delivered to you in 1.432 seconds using 27 queries.